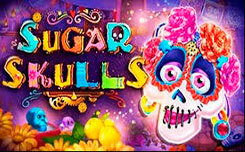 Go to Mexico and learn more about the local culture with an exciting slot from Booming Games – Oh Catrina. Take part in one of the most recognizable and fun festivals in the world – the Day of the Dead. You are waited with food, drinks, dances and that the most important, large prizes. Oh Catrina! Is a slot with 5 reels, 3 rows and 15 winning lines, which has a lot of fascinating additional functions. Symbol wild – candles, it helps to compose winning lines, by replacing simple symbols. Scatter, when three such symbols appear on the reels, a bonus round of ten free spins is triggered. Before starting free spins, an expanding symbol will be randomly selected. If three or more of these icons fall on three reels, the symbol will expand to the entire drum, and you will receive payouts for all active lines with them.